China is not the biggest oil consumer in the world, that prize goes to America, nor is it the biggest importer - which is also the USA. What China outdoes the rest of the world at is the growth of its appetite. Ten years ago China imported no oil at all. Last year it overtook Japan to become the world's second biggest importer. Its thirst continues to grow. Imports are expected to rise another 40% this year. For the international oil market it has all come as something of a shock. The reasons are not hard to find. The BBC Beijing bureau overlooks the city's second ring road. Ten years ago, the road was devoid of traffic, the odd bus, a few taxis, and lots and lots of bicycles. Today it is gridlock. At five in the afternoon it is more like a six lane parking lot. In the last few year, the Chinese have taken to cars with alacrity. Beijing now has more than two million private cars. Many are small hatchbacks, but there are a growing number of hulking gas guzzling sports utility vehicles. Even the Hummer has made it to the streets of Beijing. Then there is the problem of supply. In the 1950s, China discovered massive oil reserves in the far north of the country near the border with Siberia. For 40 years the Da Qing oil field has kept China self sufficient. 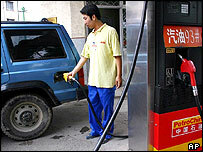 But just as China's demand for oil is surging, the pumps on the Da Qing oil field are starting to splutter. The search for oil has become frantic. In the deserts of China's far west, teams of oil men have been searching for more than a decade, but so far nothing. In the South China Sea, exploration rigs have been test drilling for even longer. They have found quite a lot of gas, but so far no big new finds. 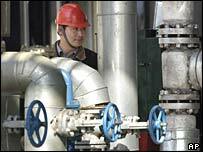 China has tried to buy up oil fields in central Asia with mixed results. It is trying to persuade the Russians to build a pipeline from Siberia to keep the Da Qing oil refineries pumping, but the Japanese are also competing for that pipeline deal. The result is that China is facing an energy shortage. Even its massive coal supplies cannot keep up with demand. In the factories of east China this summer the lights have been going out. In one Taiwanese owned factory they say they lose their power supply for at least two days a week, and every night. The factory has installed four huge diesel generators to keep production going, but the generators need fuel too. The only people who seem happy are China's shipbuilders. On the slipways of Shanghai and Guangzhou, armies of welders are assembling a fleet of new ships to bring energy and materials to China, iron ore and natural gas from Australia, and oil from anywhere China can get it. China is negotiating with Sudan and Nigeria, Russia and Iran. Only one thing seems certain, China's appetite for oil shows no sign of slowing. Today China has 10 million private cars - by 2020 that number will be 120 million.